FNG - Friday Night Gamers (Utah): GEEX 2010 TrackMania Tournament App Test a Success! 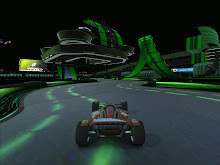 GEEX 2010 TrackMania Tournament App Test a Success! Regardless, it was a good stress test for the app and I learned a lot and fixed a lot with it. The podium screen now only shows the top 3 standings to everyone; then shows your current standing (same as typing /rank) if you're below third place. My "debug" chatter that shows up in the app's UI was getting taxed again with 16 people in it... started getting behind after about 10 races or so, to the point it didn't report the scores one track. Showing nicknames instead of login names on the Standings and Rank reporting. Any other stress-related issues we might encounter in future testing. I had a ball last night and I hope the rest of you did to. We had people from all over the world join, including some from Austria and some from France... and the one from Austria we asked if he had connection issues. He reported a smooth connection, and there was much rejoicing. A few of the racers were very high-ranked, including my old friend Scrappy who is in the Top 2500 in the world, and a couple others that were in the Top 25,000 in the world... which meant the times we were fortunate enough to beat them in a race, we earned some sweet multiplayer ladder points. Good challenge. Good times. I'm hoping I can sneak some time before next Friday to run more tests, so you FNGers may be getting more invites to help. I appreciate all your support and hope this will help make the TrackMania tournament at GEEX more fun. My apologies if any of you jumped in to find me in-game last night... I didn't actually log in to the game and start playing until way late... the first part of the night I was solely working on the app and the dedicated server... chatting with those in the server via ServerMania. If I missed you, I'm sorry. Catch us next time! Win a Copy of TrackMania United Forever!